We probably do not know all the Pools in Egypt. Are you missing any? Contact us!. For Egypt and its vicinity, we're showing you all the registered pools, some of them have no GPS coordinates and can't be found on the map at the map. 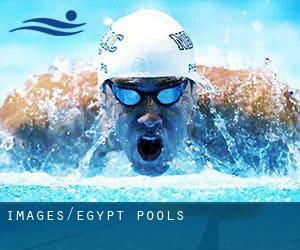 Swimia.com needs your feedback on Aquagym in Egypt to ensure all of the information about swimming in Egypt is valid. Before trying any pool, make sure you know the rules and regulations for Egypt Pools as they may not be the same as in your home town. We suggest you get in touch with the pool directly to ask for those who will need to have a hat, and what type of footwear or distinct clothing you will need. Swimming is a sport for all ages. It helps young individuals to tone their muscles and grow healthy and strong. For the elderly, there's no better solution to workout than getting a Egypt Swimming Pool to escape from day-to-day routine. Most of the Egypt Pools deliver both open lanes for independent swimming and also guided activities like water aerobics or Aquabike. One in the advantages of outdoor swimming in Egypt could be the possibility to sunbathe during the summer season. Taking it with additional care, sunbathing is healthful since introduces Vitamin D into the body, so the top option seems to be switching between indoor and outdoor pools depending on the season. There are a number of causes why you must choose a heated swimming pool in Egypt. The most significant one relies on the importance of keeping the body temperature stable. If the water is too cold, your body will try to warm it up and you will lose strength to swim properly. Without a shadow of a doubt, swimming in Luxor is the ideal way to unwind right after work. Take a couple of minutes to browse Swimia's catalog to find a Swimming Pool in Luxor. Swimming is a excellent idea to keep your body active during your visit to Suez (Egypt), or perhaps in case you are a local. Swimia helps you to find your closest Swimming Pool in Suez. Whereas Alexandria is one of the six most populous cities in Egypt with nearly 3.811.516 residents, you shouldn't miss that one if you're going to Egypt. Whereas Asyūţ is one of the six most populous cities in Egypt with almost 420.585 residents, you shouldn't miss that one if you're going to Egypt. Let us tell you a secret to switch off whilst you are in Giza: just choose a Swimming Pool in Giza and plunge into the water! There's no a lot more powerful method. It's hard to visit Egypt without dropping by Port Said (with 538.378 residents). Presently Swimia is showing you all the Pool in Port Said along with the closest pools located in its vicinity. Holding an estimated population of 431.052, Al Maḩallah al Kubrá is among the most important cities in Egypt. Check all the Pool in Al Maḩallah al Kubrá and its surrounding area. Without a shadow of a doubt, swimming in Cairo would be the best technique to unwind immediately after work. Take a couple of minutes to browse Swimia's catalog to find a Swimming Pool in Cairo. 35 Giza Street , Giza , Cairo (Postal Code: 12311). Among all the activities offered by the center, for anyone who is interested in swimming you can enjoy 21.5 meters 3 feet - 5 feet depth, Outdoors. Just in case you want to get in touch with this Swimming Pool before dropping by, we only know the phone number. Taba Heights Resort , Taba . This sports center provides Olympic size ""lap pool"", Outdoors. Contact information for this Swimming Pool just like phone number and email address are number. 1 Four Seasons Boulevard , Sharm El Sheikh , Sinai Peninsula . This sports center delivers 56 meters, 1.2 meters depth, 1.2 meters depth, Outdoors. For this Swimming Pool, only phone number is number here. Corniche El Nil , Cairo (Postal Code: Unknown). This sports center gives 25 meters - 30 meters, Outdoors. Contact knowledge for this Swimming Pool for example phone number and email address are number. Siwa Oasis , Siwa . Swimmers like you reported 25 meters x 12 meters, Outdoors. Unfortunately we do not have the email address of this Pool, but we can give you the phone number. Horreya Street , Sporting District , Alexandria (Al Iskandariyah) . This great and large sports center lets professional swimmers like you enjoy Olympic size, 10 lanes, Outdoors. Additionally, within these facilities you can try Olympic size, 8 lanes, Outdoors. Unfortunately we do not have the e-mail address of this Swimming Pool, but we can give you the phone number. Alexandria Desert Road , Pyramids , Giza . Among all the activities offered by the center, for anybody who is interested in swimming you'll take pleasure in 25 meters, 8 lanes, Outdoors. If you might want to contact this Swimming Pool, email address and phone number are both number. Abtal El Tahrir , Aswan . This sports center gives 25 meters, 8 lanes, Outdoors. For this Swimming Pool, only phone number is number here.